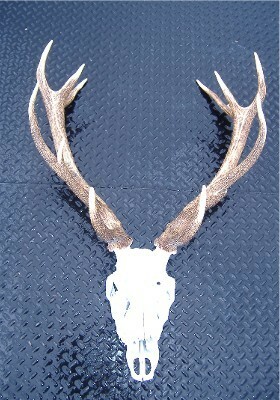 This beautiful skull is off of a Red Deer from The Wildlife Ranch in Mason, Texas. Skulls like this are great for making lamps, knife handles, jewelry, decoration, and many other things. Great for any hunting enthusiasts or crafters! The main beam lengths off this Red Deer Skull measure 25 (left) and 26 1/8 (right). The greatest inside main beam spread is 18 5/8".Greatest circumference between points one and two is 5 4/8"(left) and 5 3/8"(right). Greatest circumference between points two and three is 4 5//8"(left) and 4 7/8" (right). Greatest circumference between point three and four is 4 4/8" (left) and 4 4/8" (right). First point length is 10 5/8" (left). First point length is 10 6/8" (right). Second point length is 8 2/8" (left) and second point length is 5 2/8" (right). Length of third point is 11" (left) and 11 2/8" (right). Length of fourth point is 7 5/8" (left) and 7 5/8" (right). Length of fifth point is 4 5/8" (left) and 5 1/8" (right). The right side has a ring point.